“Don’t swallow maror without chewing it” means that we need to work on our unity with greater perseverance despite our inability to reach it. If we in the group agree with the need to unite, then we have entered Egypt. Previously, we did not agree or even speak about it. First, the brothers neglect Joseph and throw him out. But then there is a famine and they agree to unite, and then they enter Egypt. This is the meaning of “Don’t swallow the Maror without chewing it.” We are obliged to “chew” this work and feel all its bitterness and heaviness, like the bitter and hard horseradish from which Maror is made. From hard work and our failure, we soften and, out of desperation, turn to the Creator. Only after hard work do we begin to feel our captivity and the need to come out of it, and we begin to feel that there is a force that can help us. In order to come to redemption, it is necessary to feel the exile, as it was said to Abraham: Torah, Genesis 15:13: You shall surely know that your seed will be strangers in a land that is not theirs, and they will enslave them and oppress them, for four hundred years. That is, you must feel very bad in your desire to enjoy. Although it can bring a person a lot of pleasures and fillings, wealth, honor, power, and all the abundance, a person decides that this is exile for him. After all, he begins to appreciate spirituality, the quality of bestowal, above all corporeal possessions. Therefore, he cannot tolerate this exile. On the contrary, the more pleasant, satisfied, and rich the Creator makes his life during the “seven years of famine,” the more acute is his desire to break out of it. He has all the benefits in abundance, but he does not agree to live like this, feeling that he is being bought by being given animalistic pleasures, yet spiritual pleasures—bestowal and the upper world—are hidden from him. When a person begins to feel his state in this way, then it means that he is already worthy of redemption. The difficult thing about studying Kabbalah is that it requires you to acquire new values. That is why those who are not ready or willing to do so due to lack of patience, leave. They do not believe that this study will bring them actual results and do not really understand what this science is about. Here you need patience to let the upper Light work on you—the force that transforms us into a new being. Gradually, we begin to feel, understand, and judge through new definitions. Although it seems like someone is the same person on the outside, in reality he is completely different. He is impossible to define by the regular, corporeal definitions, values, and rules. Now he thinks in terms of similarity of form with the upper force, quite differently. Such qualitative change is received through the influence of the upper Light, through undergoing an intricate inner revolution. This takes many years because such changes occur in a person gradually, in small steps. And even this is hard to take. It is much easier to advance with the group that you can hold onto. If a person holds onto the group with his eyes closed, he overcomes all the difficulties. He closes the door on his old values and receives new ones from the group, from the unification of the friends, meaning the new Kli, where ten become as one: he receives a new mind and feelings, a new attitude, new measurement units. It is a very delicate, difficult period about which it is written: “A thousand enter the classroom and only one exits into the Light.” You have to have plenty of patience for the upper Light to work on you and give you new qualities. When it is said: “Do anything but leave,” this is what it is talking about. #Ego/driving force of civilization, is growing! Result: the world economy is collapsing, debt crisis growing, refugee masses will cause unrest. All this will force strong states to isolate, impose duties, build protection & borders from chaos. The US started it! 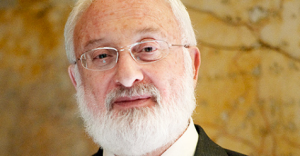 Kabbalah explains: there’s only one way to evolve – rise above the ego. It evolves & we aren’t contrary to nature when acting in accordance with egoism. We only bring the Creator’s force in the world, that will connect distant egoistic parts and lead all to peace & welfare. Spiritual work doesn’t stop at Ego’s rejections. It’s necessary to recycle egoism into the property of bestowal (Binah) & then into the property of Keter (love), receiving in order to bestow. Hence, Ego shouldn’t be suppressed. We must tame it to do proper work for bestowal. The Creator shows me my #Ego-opposite forms of Himself & I love Him above them for He is the property of absolute love. In rising above ego-calculations I achieve adhesion with Him. In the property of love I’ll see the reverse world/reality filled with bestowal & the Creator. It is written: “The greater the person, the greater his ego is.” If my ego grows and I keep cancelling it, then I grow. Equality is when everyone tries to rise above his ego. This makes us equal. Although we are all different in our egoism. Pharaoh is desire to rule, rise over everyone & to trample everyone. It turns us into slaves of money, #social status, fashion. Egyptian executions, like our internal GPS, warn us: “Stop, make a recalculation of your path!” So we find “Moshe,” the power of unity & love! Egoism is driving civilization; it grows & humanity is split. The world economy system collapses. Debt crisis, bubbles, stock market’s fall, refugee riots, fake news, and robots will make weak countries fall. Strong countries are forced to isolate themselves. Before #Passover, I wish everyone in the world PA-SACH – to overcome the boundary between our world & the upper world. This is the true meaning of the holiday. It happens by correcting our ego with the upper Light. In the corrected ego, we will feel the eternal, good upper world. Passover is an opportunity to pass over from a state of #divisiveness, disregard, and coldness in modern #society, to one of unity, care, and warmth. There is no leader in a group of Kabbalah students. One can have a duty or temporary authority. The main law of the group is total equality, regardless of experience, age, knowledge, etc. The main rule is: each one lowers himself and prays for everyone! When I comment on matters related to Donald Trump, I am not relating to his personality. Many see Trump as a poster child for the human ego, while the most basic understanding in the wisdom of Kabbalah is that all people are driven by their egos. Therefore, his public image is irrelevant to me. What I am commenting on is the role he currently plays in the current state of global affairs. Our world is in a developing crisis, and various interconnections being made by powerful global players who shape the world’s economy, politics and media only deepen the crisis, as they too are driven by the human ego. Therefore, if we weaken such egoistic connections, we alleviate the crisis, which can easily spiral out of control. This is a natural dynamic that has nothing to do with Trump himself. I have expressed this many times before, but unfortunately, this message is not being clearly heard. Trump represents an approach to global affairs that lowers the risk of another world war, specifically because he is tearing down certain international connections, as if holding the brakes, by trying to bring America back to where it was on the global economic map. As long as the world develops according to the human ego, such moves by Trump help maintain the relative peace in the world. The ruling elites are attempting to join hands and increase their financial control by making various international trade agreements which ultimately strip the people of the world from everything they have. They produce the guise of economic development in some developing countries, but in reality, all the profits go to the elites, and all the burden falls on the masses. Therefore, the current development toward global integration is not the kind of development that will benefit the world; it will only benefit those who are pulling the strings. This is why these global players are opposing Trump. They hold much of the mainstream media in their hands, and they design the impression that most of the public and all sane people are against Trump. They also do well in staging what seem like natural waves of social protest. Unfortunately, the propaganda and brainwashing are so powerful that even some of my students are being influenced, as they fail to see that there are vested interests working behind the scenes and that people don’t go out to protest without being manipulated into doing so. It’s a well-oiled machine, fueled by many millions of dollars. So I don’t take my cues from what’s playing on the media or what most people say, and I also don’t work for Trump. I am explaining the world through the lens of the wisdom of Kabbalah. I have no interest in playing the childish game of picking a side—being for or against anything. My commentary comes from a different level altogether: the natural forces at play. From that level, it’s perfectly clear that as long as egoists are driving global connections, it’s better to sever them than to strengthen them. In general, I look at all the phenomena in the world as expressions of the fundamental laws of nature, and I use them to explain Kabbalah’s take on the process the world is going through. Kabbalists write that “dispersing the wicked is better for them and better for the world” (Mishnah Sanhedrin 8:5). In other words, the whole world will be better off if the ties between those powerful players are broken, as their egoism only serves to exploit all other people to the fullest. Our evolutionary social development pushes us to utilize our wiring for human connection, to distill it through constant work on our relationships, and evolve to a new social reality. 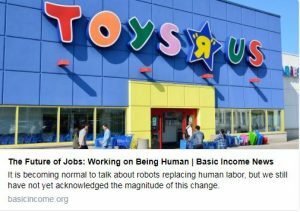 Rather than competing with robots for an old school job, let’s make our job the only function that no robot will ever replace, and find the kind of happiness that money will never buy.